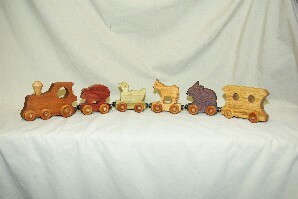 0569 Animal Train Set, 6pc magnetic  - $53.35 : Red Bird Mission Crafts, Hand crafted art. 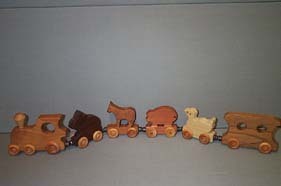 This 6 piece animal train set has 4 animals(pig, rabbit, horse, duck) and a whistle in the engine. Just blow into the back of the engine and hear the train whistle! WOW! The whole set is about 25" long with a magnet between each piece. It's finished with a non-toxic mineral oil rated for food contact. This is a child-safe finish that preserves the natural wood feel of the simply designed and sturdy toy.